In Stanley Kubrick’s seminal film 2001: A Space Odyssey, there is as scene set deep in the evolutionary past of human beings when apes encounter a sleek black monolith. After touching the shaft, the apes “take a giant leap forward: for the first time, they use tools—specifically, they start using bones as weapons with which to strike down their enemies,” said Paul R. Mueller, S.J., at the fall 2018 Clavius Distinguished Lecture on Oct. 1 at the Rose Hill campus. Titled, “Comets, Craters, and Calendars,” the lecture celebrated the 480th anniversary of the birth of the great mathematician and astronomer Christopher Clavius, S.J. Father Mueller is the vice director of the Vatican Observatory and superior to its Jesuit communities in Rome and Arizona. Following the talk, a panel of Fordham mathematicians and scientists shared how Clavius influenced their lives and work. For the lecture, Father Mueller took listeners on a tour through the history of a man who, among his many accomplishments, is perhaps most noted for championing and helping design the Gregorian calendar that is still in use today. But the calendar, famous as it may be, was not the primary focus of Father Mueller’s talk. Instead he equated the scene from 2001 to Clavius’ championing of mathematics. “In my view, Clavius played a historical role somewhat akin to that of Kubrik’s monolith: Through his teaching and textbooks and curricular reform, Clavius was the midwife of one of humanity’s great leaps forward: the scientific revolution,” he said. Father Mueller was careful to point out that Clavius, who was born in Bamberg, Germany, may not have played an “active first-person role in the scientific revolution of the first half of the 17th century,” as he died in 1612. But through his many years of teaching at the Jesuit Roman College and through the wide use of his textbooks on mathematics and astronomy, Clavius greatly influenced the innovators and discoverers. He also “amplified” the importance of mathematics at universities, Father Mueller said, which theretofore had been taught at the 16th-century equivalence of high-school level. Having joined the Jesuits in 1555, Clavius was received into the order by St. Ignatius himself, placing him amidst the “explosive growth” of the young order and its ever-expanding roster of Jesuit schools. Near the time of Clavius’ death there were 372 Jesuit schools that would have been the equivalent of junior colleges today. 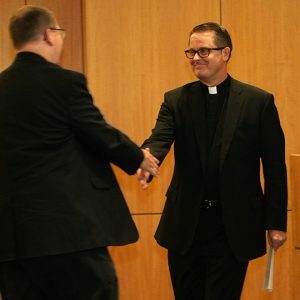 Even outside of the Jesuit institutions, from the 1580s to the 1640s “just about everyone got their introduction to math and astronomy from textbooks written by Clavius,” said Father Mueller. Father Mueller noted a few examples of Clavius’ fame, which he cemented through his role as the official public explainer and defender of the calendar. As a young professor, Galileo relied on lecture notes obtained from Clavius’ math and astronomy class, which led him to conclude Clavius “worthy of immortal fame.” During Clavius’ own lifetime he was known as “the Euclid of our Time.” And at St. Peter’s Basilica in Rome, there are only two Jesuits who are portrayed: St. Ignatius of Loyola and Clavius, who can be found on the tomb of Pope Gregory XIII, presenting the new calendar. 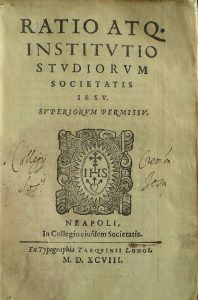 In Part VI of his Constitutions for the Society of Jesus, St. Ignatius called for a separate document to provide guidance for Jesuits schools. That “separate treatise” eventually became the famous Ratio studiorum of 1599, and Clavius held significant sway in its treatment of mathematics, said Father Mueller. 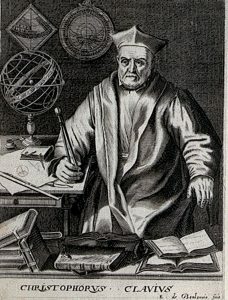 Father Mueller said that both the new Gregorian calendar and Clavius’ proposals for an augmented role for mathematics in the curriculum met with significant resistance, and in both cases Clavius took on a “prominent role as explainer and defender”—of the “validity of the calendar and of the dignity and worth of mathematics as a path to objective truth.” It’s a role that resonates to this day, with science and truth under attack at the highest levels of government and religion. In a conversation after the lecture, Father Mueller drew parallels between Clavius’ role and that of contemporary Jesuit institutions. In your talk, you noted that at the time of his death Clavius had not finished publishing his theory of astronomy. It sounds like he was very cautious with the truth. At the end of his life, he mentions in a letter to one of his colleagues that he’s in the middle of writing a theory of astronomy, but he also mentions explicitly that he’s waiting for more data from [Danish astronomer] Tycho Brahe, to help him know what he wants to do. He never ended up publishing it in his lifetime. I personally think what happened was he saw that astronomy was changing so rapidly, the time was not right to write a theory. 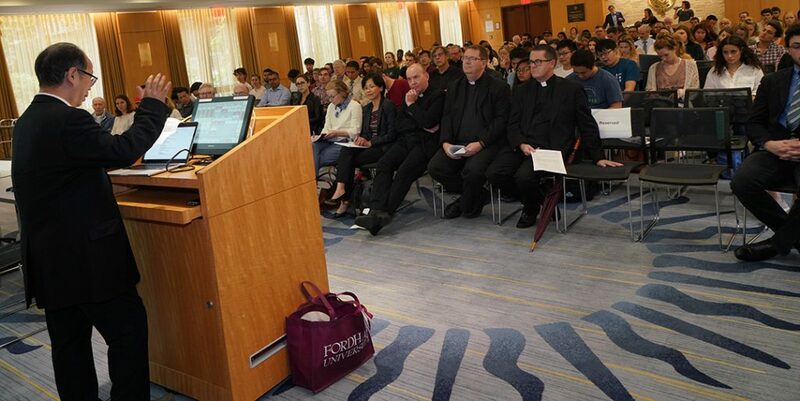 Last spring’s Clavius lecture dealt with artificial intelligence. Things are moving so quickly in that sphere that peer-reviewed articles are almost an impossibility. What would Clavius make of that? Be careful about imposing the whole notion of peer review back on him. His time is where the whole idea that empirical observation of the heavens can affect astronomical theory. That itself is a new idea. You knew your astronomical theories from ancient authorities. That’s part of what got Galileo in trouble, but I think Clavius was doing it more cautiously. The whole thing with Galileo blew up after Clavius died, so he had no notion that there was theological danger. But, I think, as a teacher, he didn’t want to go in print with a textbook with stuff that’s not right. In the late 1500s there was an extraordinary series of comets and novas in the heavens, which really wowed people because physics at the time said that the heavens should be immutable and unchanging. Clavius participated in proving this stuff shouldn’t be changing. So, I think that’s part of what slowed him down. He says at one point, ‘Maybe we need to rethink at a fundamental level, our astronomy.’ Today, we all agree what the standards are. Clavius was in a time when the very notion of standards themselves were changing. Clavius had the ability to speak to the public and the men in power to convince them of truth and the importance of empirical standards. What lesson we can draw from that today? Clavius had to explain and defend. I hope I don’t sound too despairing here, but he lived in a time when everyone knew and believed that there was such a thing as an objective truth. They might have disagreed about how to get there, the standards were changing, but no one disagreed that there is objective truth. We are now in a very strange time, a new time, where for many reasons, people’s confidence in the very notion of objective truth has been shaken. And, I find that to be a really dangerous and a sad step backwards. … I’m very discouraged by the fact that, as a culture, we seem to be backing away from the notion that we’re capable of coming to agreement on objective truth. It’s hard, you’ve got to work at it, you’ve got to be willing to fight, but there’s a truth out there. 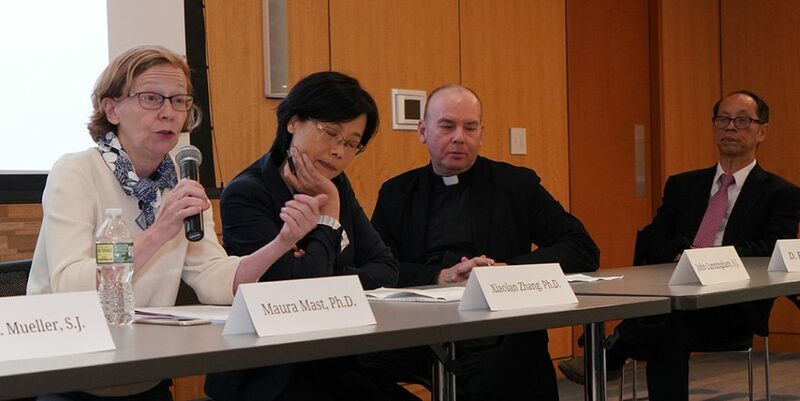 Yet so much of the recent challenges to science come from people of faith. How do you, as a Jesuit, deepen your faith in light of scientific truths? My colleague at the observatory, Guy Consolmagno [S.J. ], is always clear in saying that when he does science, for him it’s an act of worship. If God is the way, the truth, and the life, then when you look for the truth via science, you are also looking for God. I believe that the very search for truth means that I trust that my reason participates in God’s reason. I’m made in God’s image and I really think that matters. We really need to work together to come to some kind of agreement on these things, because it’s a great, lovely mystery that should bring us together. Professor Hsu opens the Clavius Distinguished Lecture at Bepler Commons.